Aurora Harris had the very good fortune to be born and raised in a truly international and multicultural family in Detroit. Her mother’s people are Filipinos, descendants of the former colonial elite, her father’s kinfolk, descendants of African American sharecroppers from Mississippi. She was inducted into Catholicism by her mother, and into Islam by her father. Shaped by this rich cultural complexity, she derived a profound sense of the strivings common to all people, of what it means to be marginalized culturally and racially, of the necessity to strive for social justice. 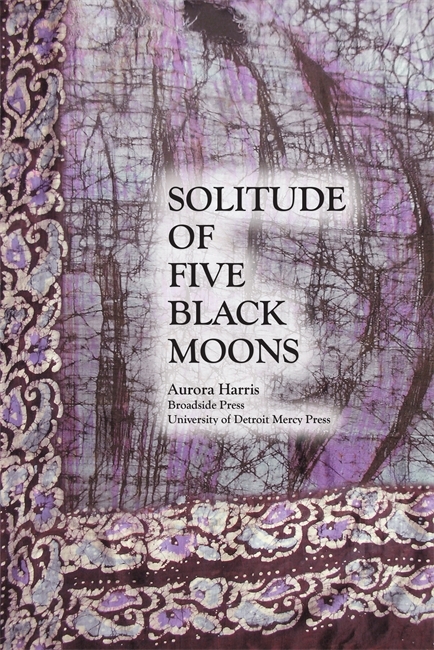 Such themes pervade the brilliant poetry of Solitude of Five Black Moons, winner of the PEN-Oakland Josephine Miles Multicultural Award for Excellence in Literature, 2012. Aurora Harris was born in Detroit of African American and Filipina parentage. She grew up in a Catholic and Muslim family where English, Spanish, Tagalog, and Ilocana were spoken. She holds an M.A. in Social Foundations and Education from Eastern Michigan University and a B.A. in Sociology from Wayne State University. Harris is an activist-educator, poet and mentor. Her poetry is drawn from a foundation of identity, history, and culture that includes family, women's lives, jazz, Detroit culture, and travel.